Kingdom in the Desert by Narwan Mahle. 6″ x 10″. There are limits to the extent that the artist can let us see through his eyes, in a literal sense, but speaking metaphorically, every artist has the potential to share their universe of artistic vision, wonders of meaningful emotion, and universal contribution to cognition. This is the goal of every artist, even one who comes from a place “burdened by its proximity to war . . . and the horror that war brings,” as Phillips Gallery’s Meri DeCaria describes the homeland of her personal friend and a gallery favorite of the past 17 years, Marwan Nahle. Nahle was born and raised in Lebanon, an area of tremendous turbulence, confusion, upheaval, tension, and senseless death. But this is not the subject of Nahle’s work. Rather, as DeCaria says, his expressive paintings are imbued with qualities of “mysticism” and “graceful, abstracted figures.” In a series of works created over the past decade and now on exhibit in the gallery’s downstairs Dibble Gallery, this visionary and independently-minded artist shows his audience just how intense and how real the artistic vision can be using canvases as small as paperbacks. The first painting one encounters in the gallery is the metaphysical “Kingdom In The Desert.” The 2005 work reminds the viewer of the Middle East, with its arid foreground and stark sky… yet the nuances of color here are very rich. To the left is a briskly rendered figure in black. He stands facing the central subject, which might be described as a sultan’s palace painted with a hallucinatory effect. One meaningful reading of this piece might be that “Kingdom In The Desert,” with its lucidly saturated colors that melt together, does not reference any single kingdom, but all kingdoms of ages past. 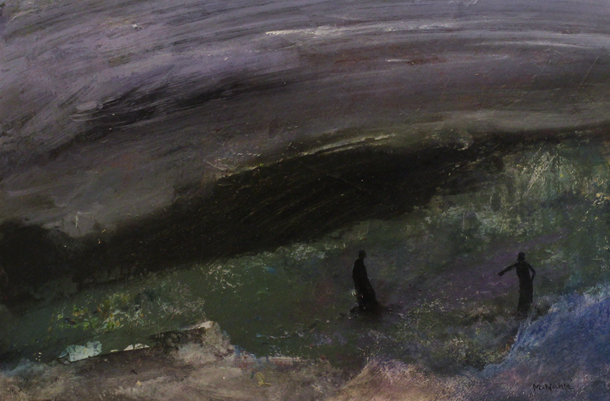 This first painting shows Nahle to be a neo-Romantic, a label that rings true in a number of other works, where small figures stand before majestic and awe-inspiring landscapes rendered in a swirl of brushtrokes. Take “Quiet and Peaceful” — this image, so small yet filled with the vastness of the human condition, is the essence of the empyrean. 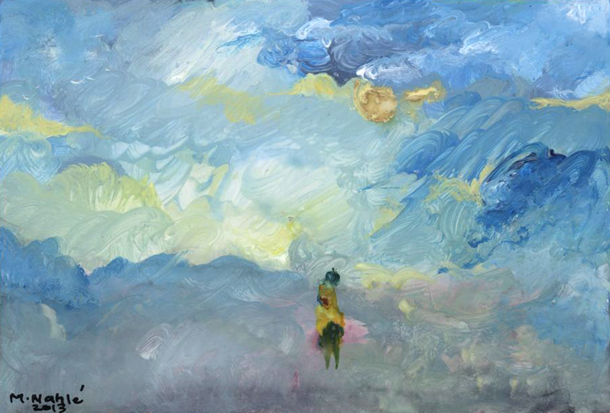 In this turquoise sky churning with lemon yellows, white and lime greens, what designates it as something beyond pure abstraction is the miniscule figure that stands towards the bottom center, surrounded by mist, in contemplation, engaging with truth. In other works, the surrounding landscape may appear daunting, fiery or foreboding, but in this gradation of the sublime, the eternal outlook is more optimistic, less tainted with the touch of traditional Romantic sublime. In “Quiet and Peaceful” one might appreciate the vastness of the human condition: this sublime, this empyrean is a fully manifest state of human consciousness at rest with itself as it is indeed, quiet and peaceful. While Nahle’s work is not generally dark, when it is, it is made so purposefully. “Intrusion” is thus, menacing and foreboding, as a great mass that has the appearance of a tsunami is about to suddenly crash upon the earth and smother all of humanity. The very small central figure at the bottom, entirely black, is seemingly unaware of the ominous threat directly behind but recoils ever so perceptively against an “intruding” force that is not coming from the surge behind but from another figure to the right, also black. Beyond this mystery, the facts are that the “intrusion” supersedes the massive intensity of the dark tsunami about to engulf all, the two figures giving it no regard. The sure enemy in life unfortunately is to be found in the other and not left to chance. Intrusion by Marwan Nahle. 6″ x 10″. Nahle’s figures are not always foils to surrounding landscapes, however, and in another group of works on exhibit they dominate the composition, taking up, singly or in pairs, the entire canvas. In a work like “Butterfly Angel” the angel is fully felt, a true presence. She is a composition of not white and gold but Indigo blue, aubergine purple, and pomegranate red. These colors are used with such honesty of emotion that the form is brought to life better with a few dozen strokes than could be done with a thousand; and the angel becomes manifest for the viewer in her pure reality just as her radiance causes her to melt into sublimity. 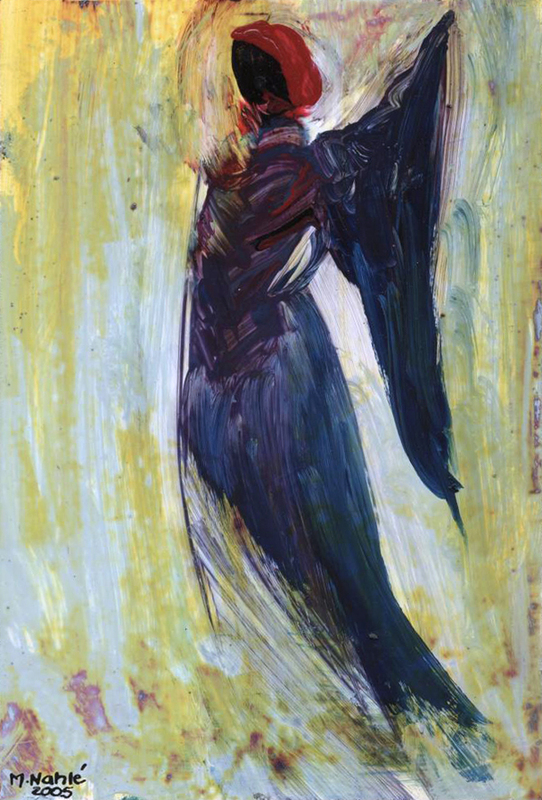 Butterfly Angel by Marwan Nahle. These avenues — be they reveries over the passage of time, celebrations of spirituality and consciousness, or the raw recognition of the world that at times can be self-defeating — are just some of those explored in Nahle’s rich experience with the human condition. Nahle is true to the traditional Romantic method of minimizing the absoluteness of the human subject and considering the realities that exist beyond an artificially man-made world that is such to lure the masses into perpetually regenerated artificiality. But Nahle is also a visionary who sees beyond the artifice and his art resonates reality as he shares his humanist vision of truth with his audience. 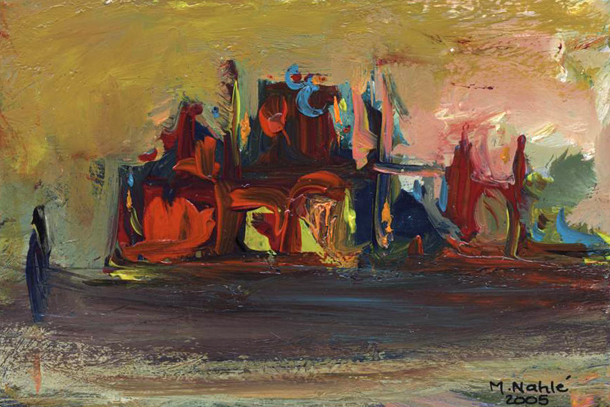 Marwan Nahle’s works are on exhibit at Phillips Gallery’s Dibble Gallery through October 11, 2013.